Step by step, a teen with an ankle injury discovers the spiritual freedom that comes from leaning on God. Each class in the National Leadership Council goes on an adventure trip in the second year of the program. This two-week trip, mostly outdoors in an environment unfamiliar to the teens, is designed to strengthen each student’s trust in God individually and as part of a supportive group. 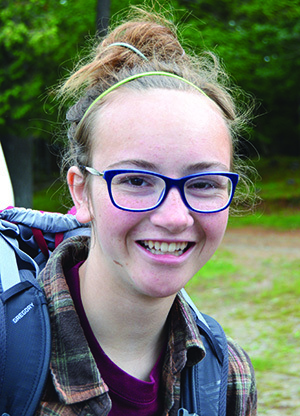 Corrina saw how that trust results in healing when she and her NLC class canoed through Maine during their adventure trip last summer. While loading a canoe onto a trailer, she fell and twisted her ankle. One of her class leaders, AmiLynne, quickly came to help. “She lost no time in assuring me that I could not be hurt, not in this environment of Love, not ever,” Corrina says. 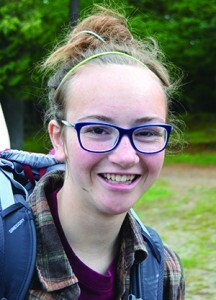 The teen spent some time in her tent, studying that week’s Bible lesson, while AmiLynne and her co-class leader, Steve, checked on her periodically. Corrina decided to rejoin her class after a while rather than allow the injury to interfere with the activities, but she struggled with a sense of helplessness. After a steep ascent, the group reversed its direction and headed down the mountain. Because of the narrow path, there wasn’t room for Corrina to move to the back, but she didn’t even consider doing it. She just turned around and started walking. And for each step, instead of saying, “ouch,” she replaced it with the statement, “There is no sensation in matter” (Science and Health with Key to the Scriptures, Mary Baker Eddy, p. 237). “By immediately replacing mortal thought with Truth, I was no longer letting these thoughts of helplessness and uselessness even present themselves to me,” Corrina says. 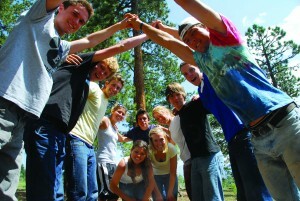 The National Leadership Council is a four-year program for Christian Science high school students, focusing on spiritual growth, leadership skills and cultivating a service approach to life.